Conferences, seminars, training, business meetings, community group activities, lunches, music groups, away days and low impact exercise groups. 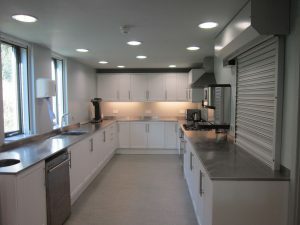 A good sized modern kitchen fitted with cooker, water heater, fridge, dishwasher and plenty of stainless steel working surfaces. This space is flexible. It can all be opened up to create a large single hall for up to 150 seated plenary style or 100/110 at tables. However there are partitions that allow the space to be divided into one large room for seating up to 90 an d two smaller meeting sized room for up to 10/12 round tables. 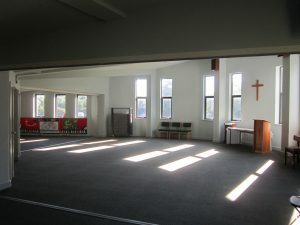 Each area is also available for individual hire and the large space has projection facilities.